There are many things I appreciate about Laurier: the three things that come to mind are people, culture and community. I joined Laurier in February 2014, after spending 19 years at the University of Toronto and a couple of years working at Georgian College. From the moment I arrived on campus, I felt a strong sense of community and collegiality among staff, faculty and senior administration. I’ve been impressed by how supportive staff and faculty have been with our internationalization initiatives; particularly, how the Laurier community welcomes and supports international students. In the fall of 2014, Dr. Blouw hosted a special president’s reception for international students. He shared his personal story about how he expanded his horizons through immigrating to Canada as a child with his family. He expressed deep appreciation of cross-cultural learning and international students’ contribution to Laurier. This encouraging gesture from our president reinforces that Laurier is a community-minded institution where not only new staff members like myself, but also new international students, can quickly develop a sense of belonging. Not many Canadian institutions can say they have been around for more than 100 years and are named after a significant Prime Minister of Canada — but we can! For more than a century, Laurier has been known not only for academic excellence, but more importantly we’ve also been dedicated to the philosophy that our students’ success is measured through more than grades – it’s based on the quality of the lives they lead, and those they inspire. Over the past year, I have been very surprised that so many people proudly shared with me that they are Laurier alumni when they heard that I worked at Laurier. Laurier, as part of the Region of Waterloo, is a vibrant and culturally diverse community to live, work and play. We are surrounded by leading-edge organizations such as Google, BlackBerry, OpenText and many new and exciting startups like Vidyard, Square and kik, which are fuelling our nation’s innovation and prosperity. It’s exciting to feel the energy and be a part of the action. There are many aspects that I enjoy about my role, but the one constant is the students. I came to Canada as an international student from China myself. I experienced first-hand the excitement and challenges that our students face today. My transition from a service user to a service provider gives me credibility for my work. St. Augustine said: “the world is a book and those who don’t travel read only one page.” Talking to students from all over the world is a part of my job. I can’t think of a better job where I am able to make a meaningful contribution while satisfying my curiosity about the world at the same time. 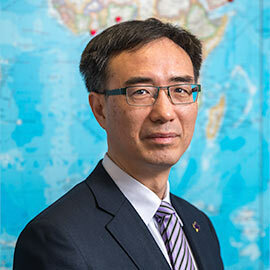 Laurier has placed educating global citizens as a priority in its mission statement and academic plan. However, Laurier’s implementation of its internationalization strategy is still in the beginning phase. There is still much work to be done and many opportunities to explore. I feel lucky that I am at the right place at the right time to utilize my skills and do what I am passionate about.